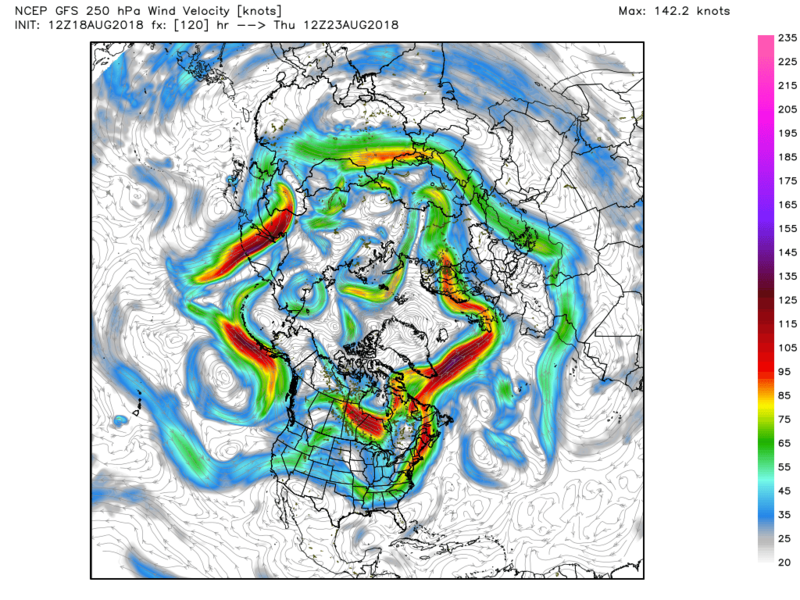 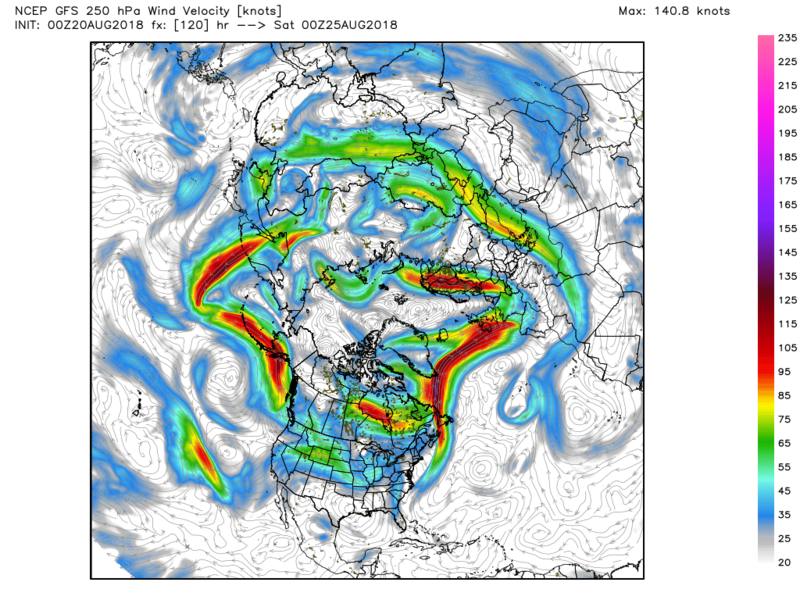 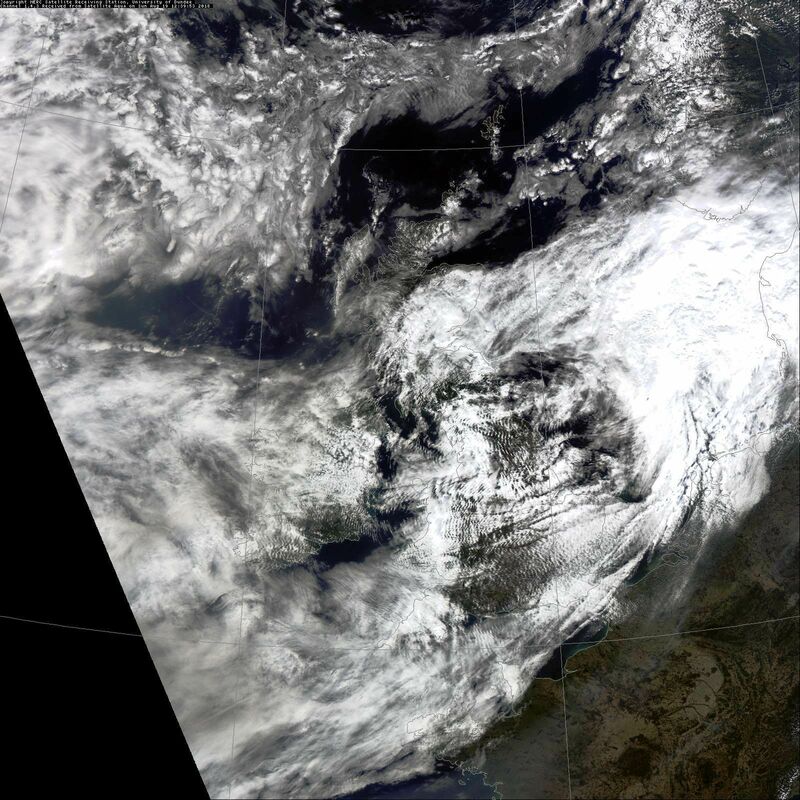 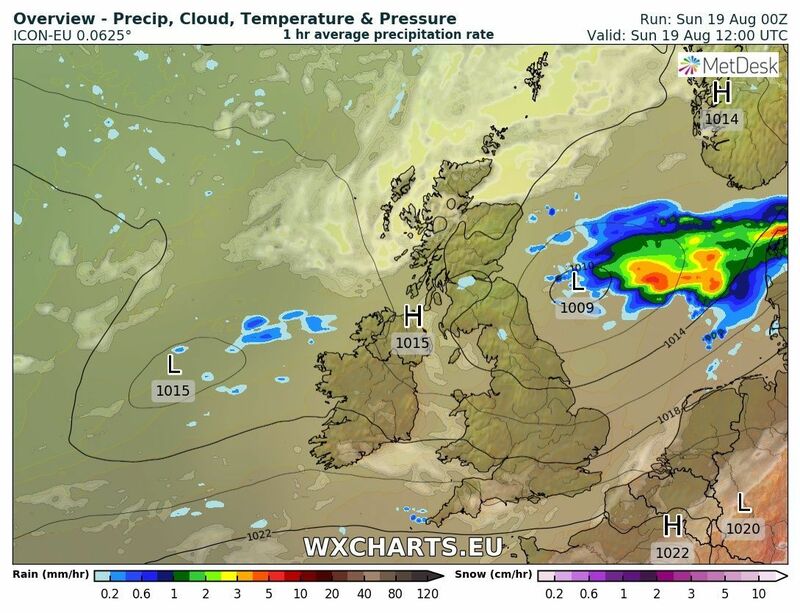 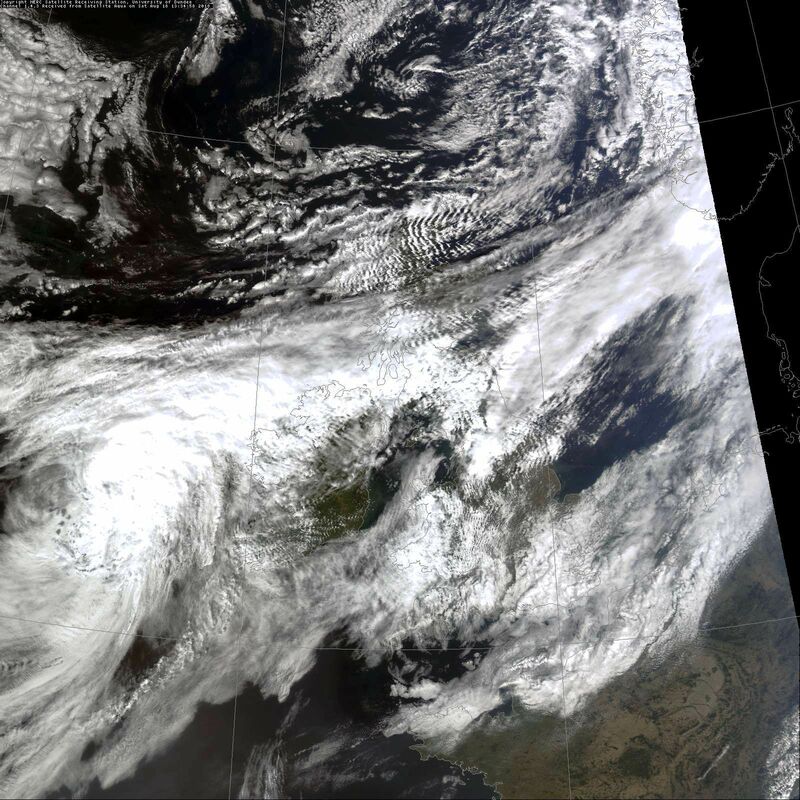 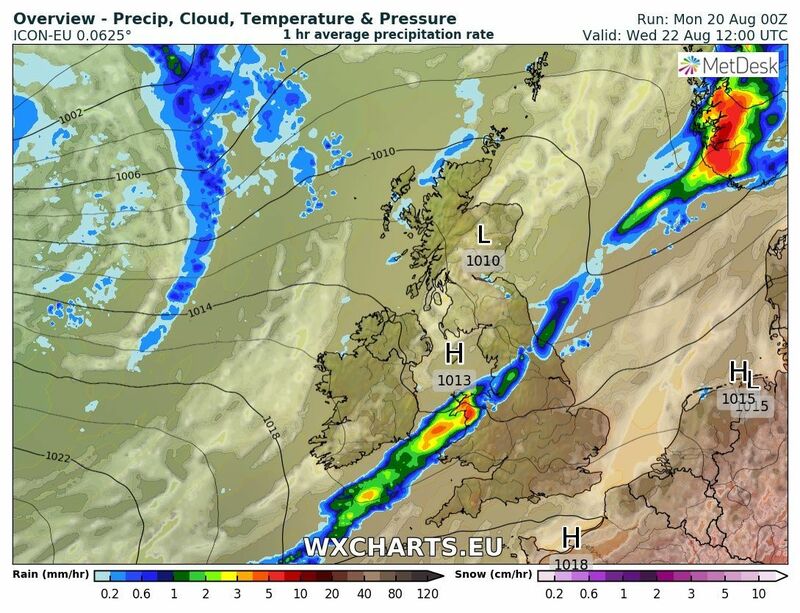 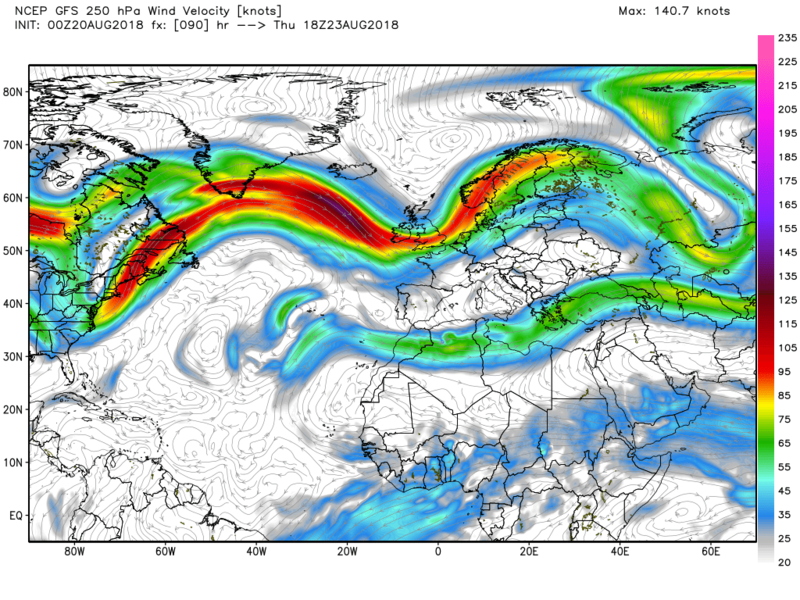 Ernesto and the rain belt will clear into the North Sea this morning leaving much of the UK in cloudy humid conditions with maybe the odd spot of drizzle with waving fronts straddled across the country and running south west. 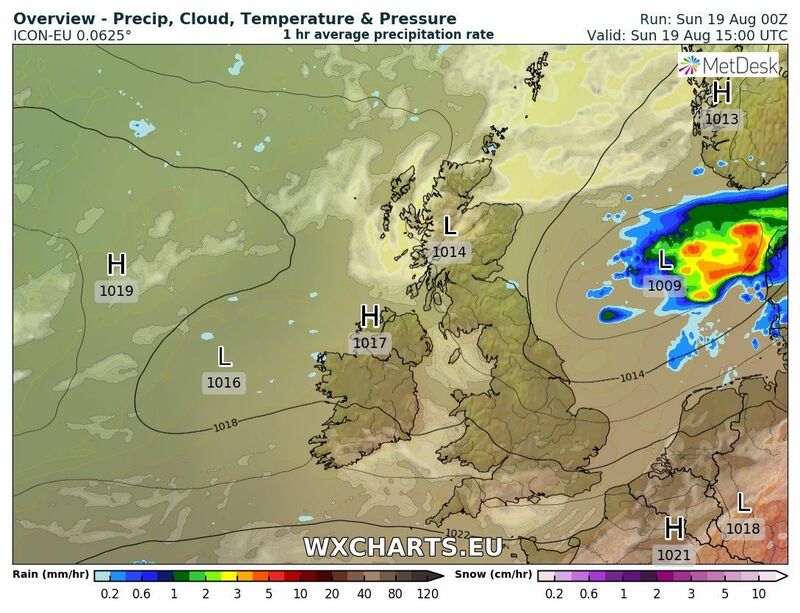 Sunnier in N. Ireland and N. Scotland and quite warm in southern areas where the sun pokes out. 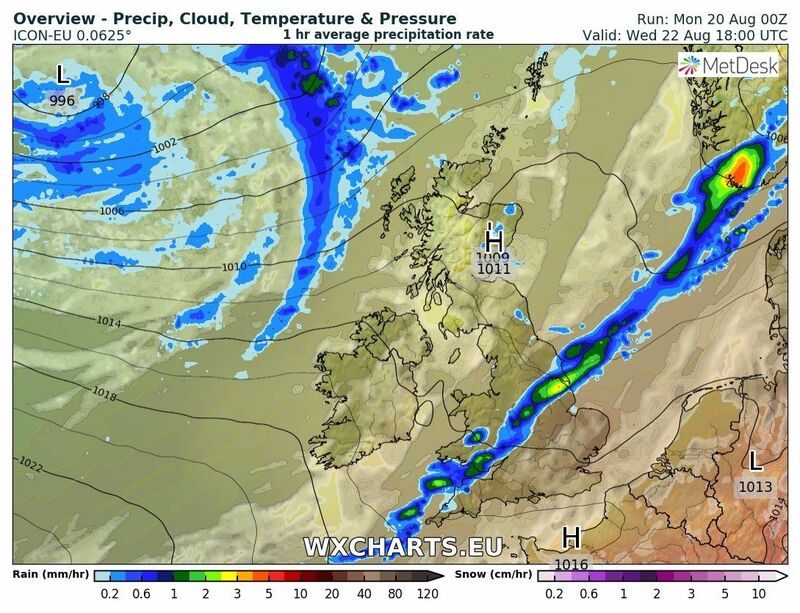 So Monday is another cloudy day in general, with the waving fronts still in attendance, but where the cloud breaks it will feel quite warm. 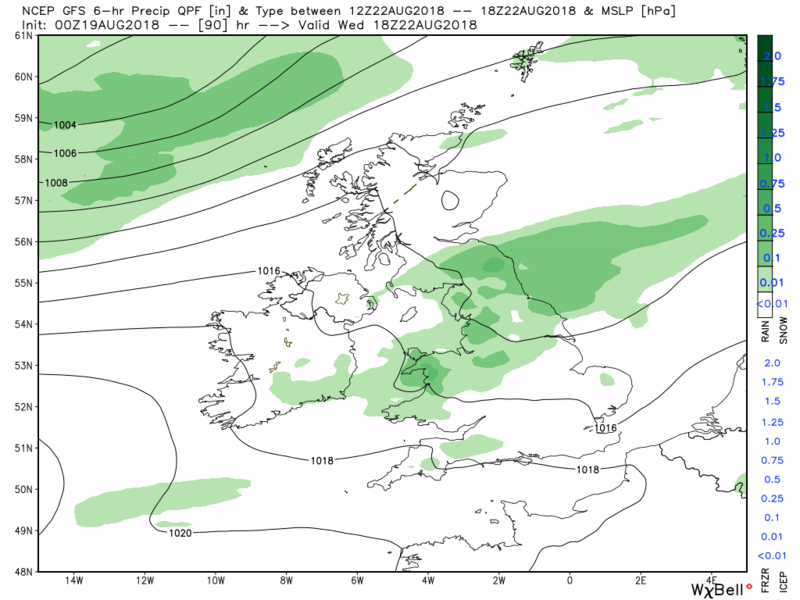 Still the odd chance of some light drizzle or the odd shower, mainly in the west. 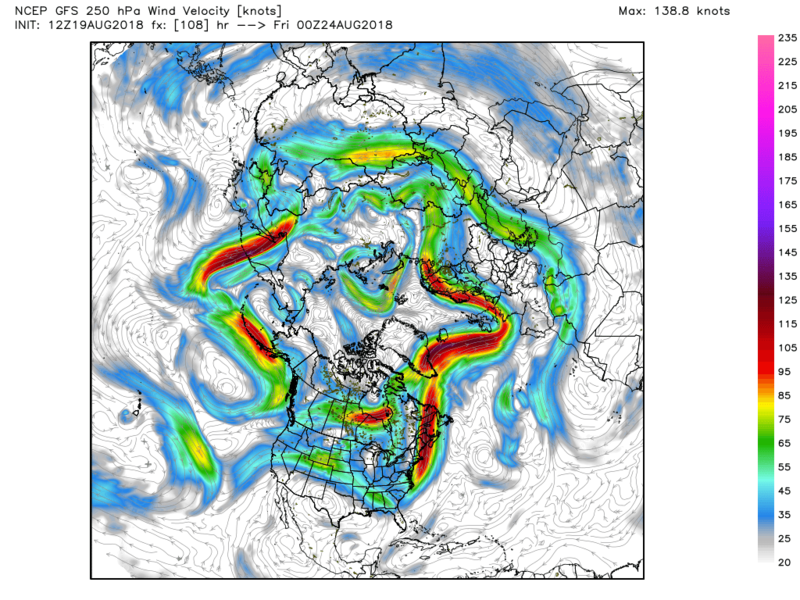 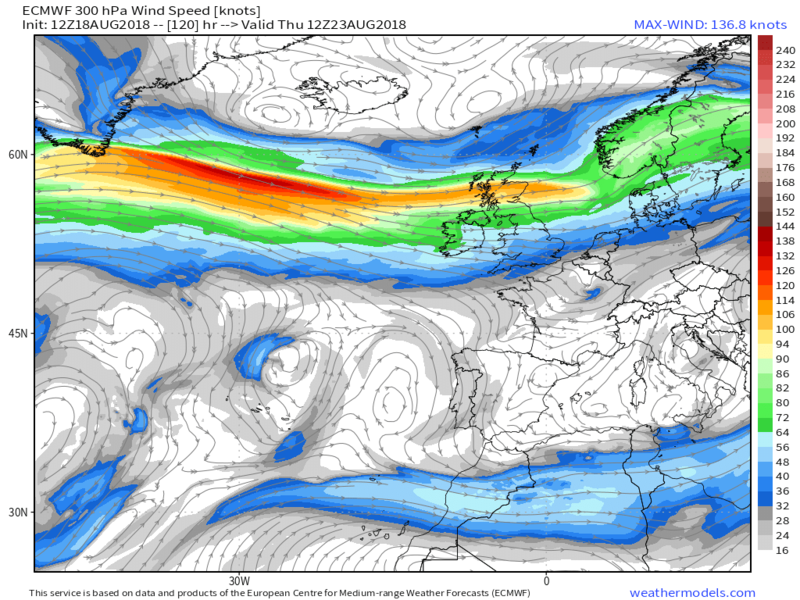 Rather an odd situation today for forecast maximums. 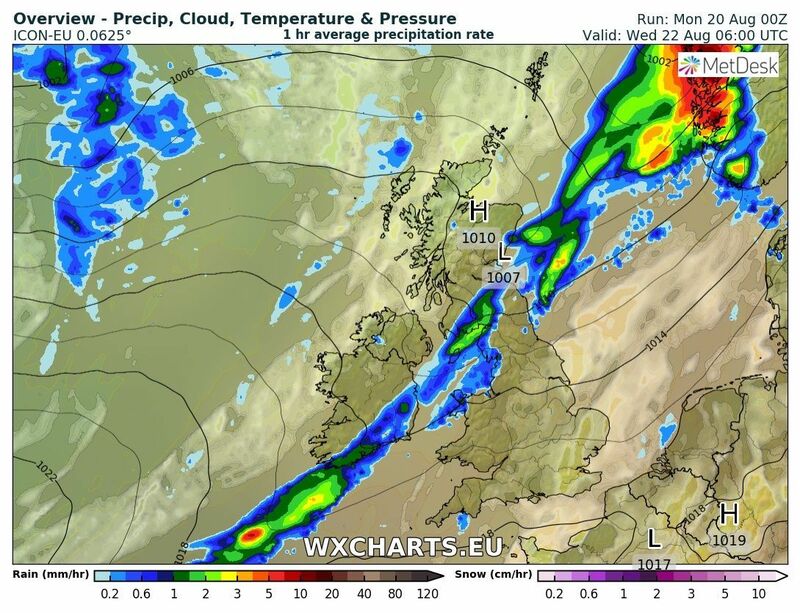 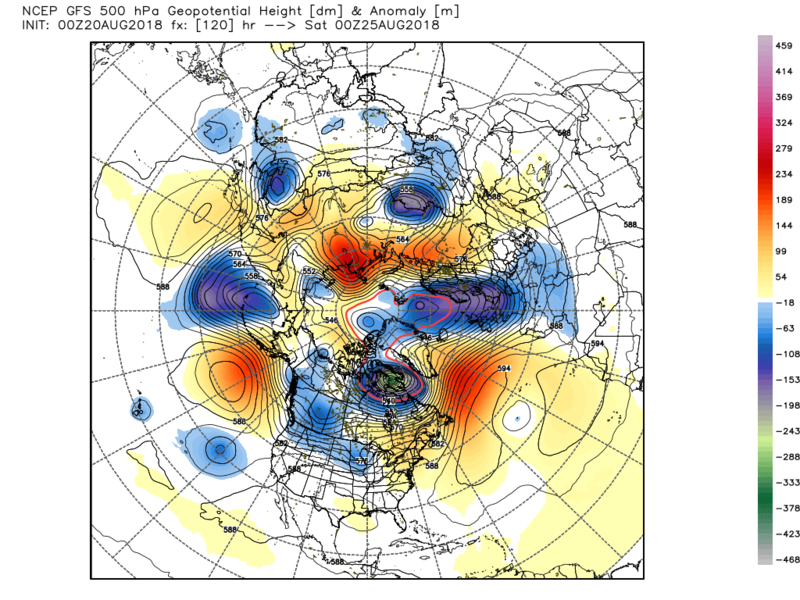 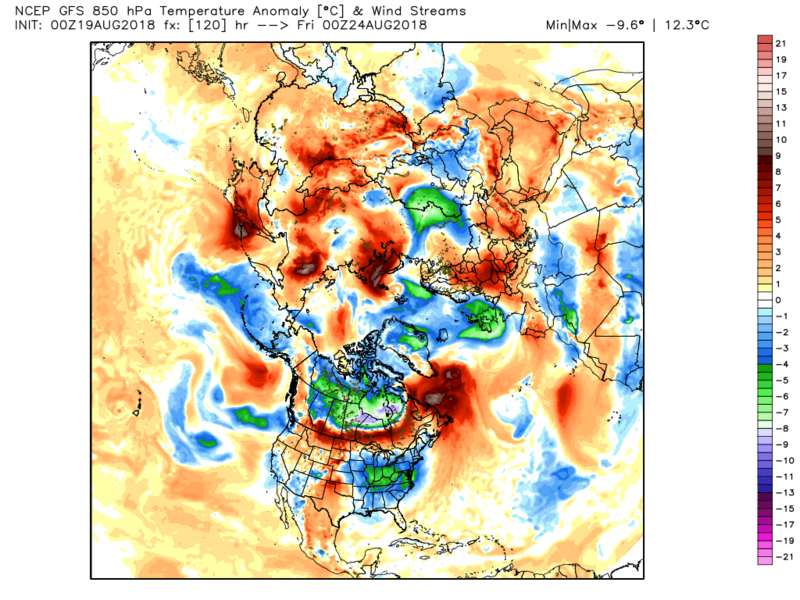 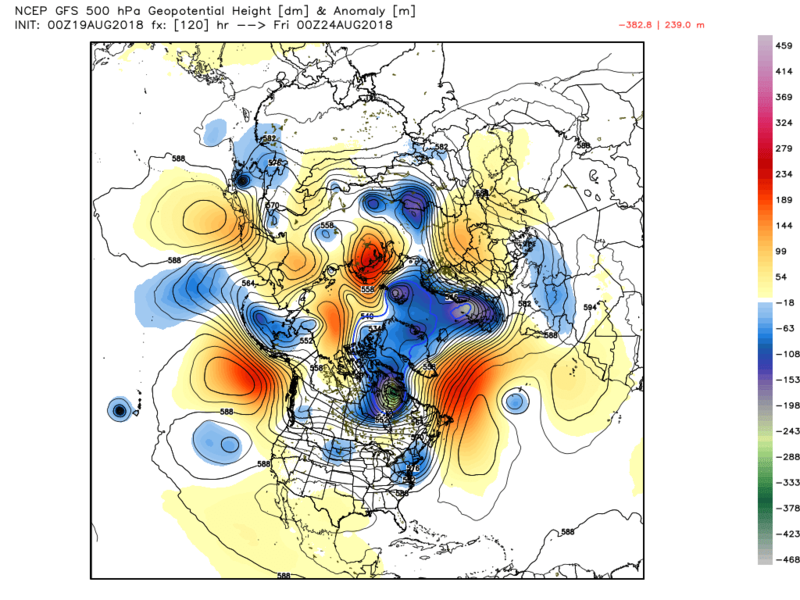 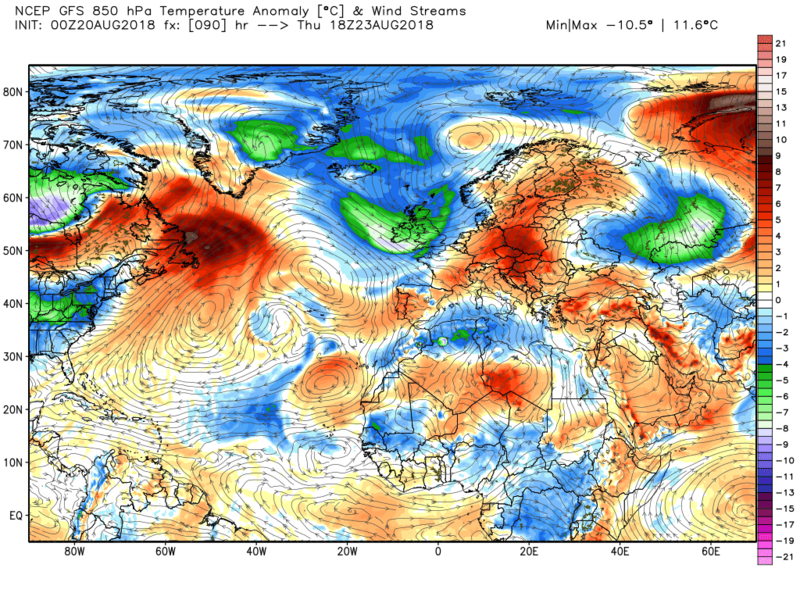 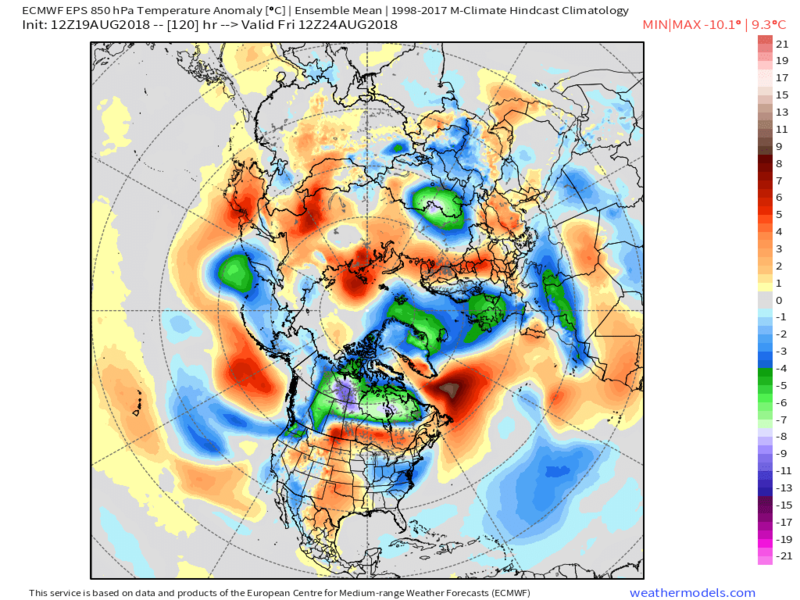 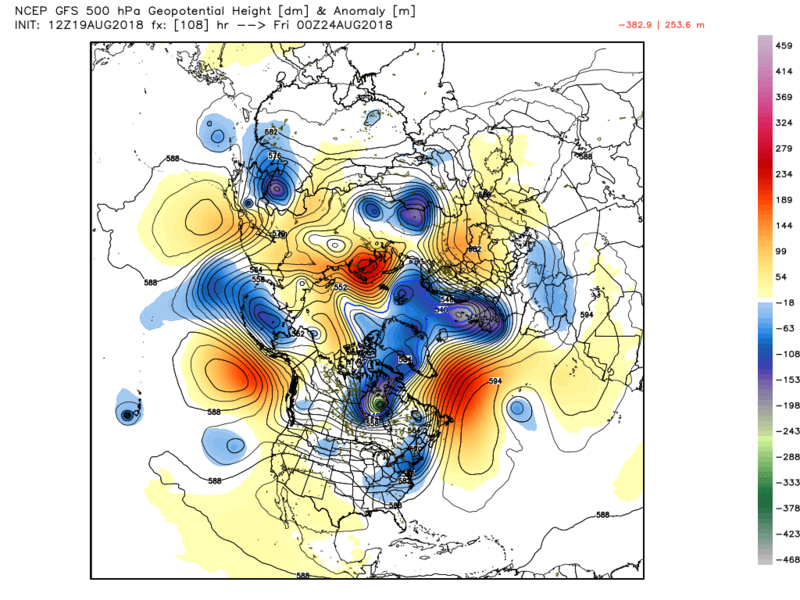 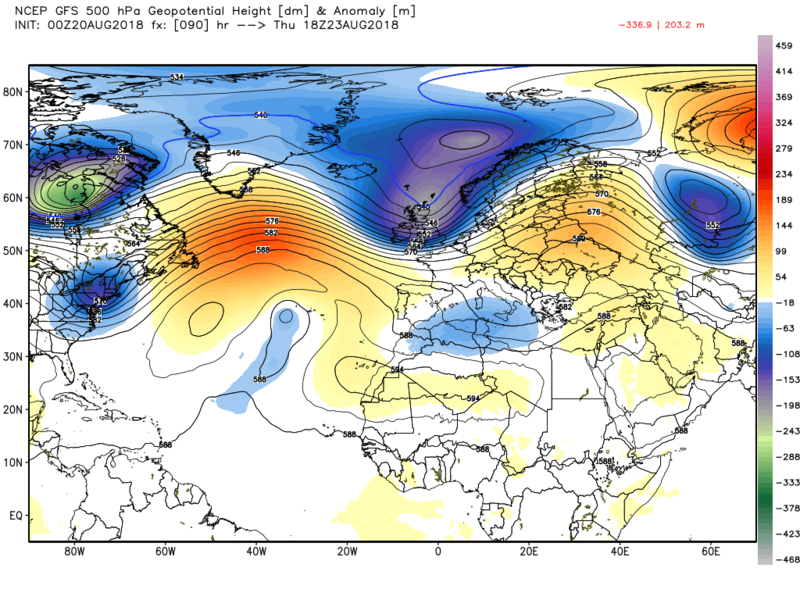 Cricky, never seen so many fronts like this one on a chart. 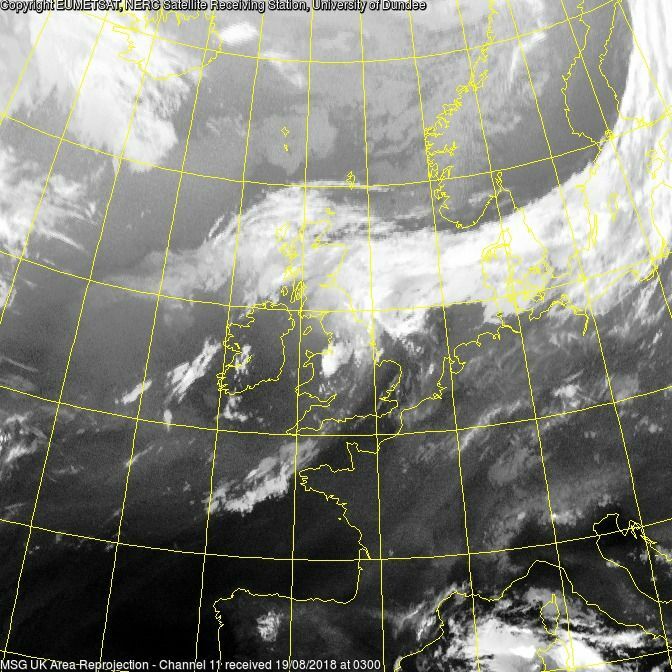 All heading for Blighty it seems. 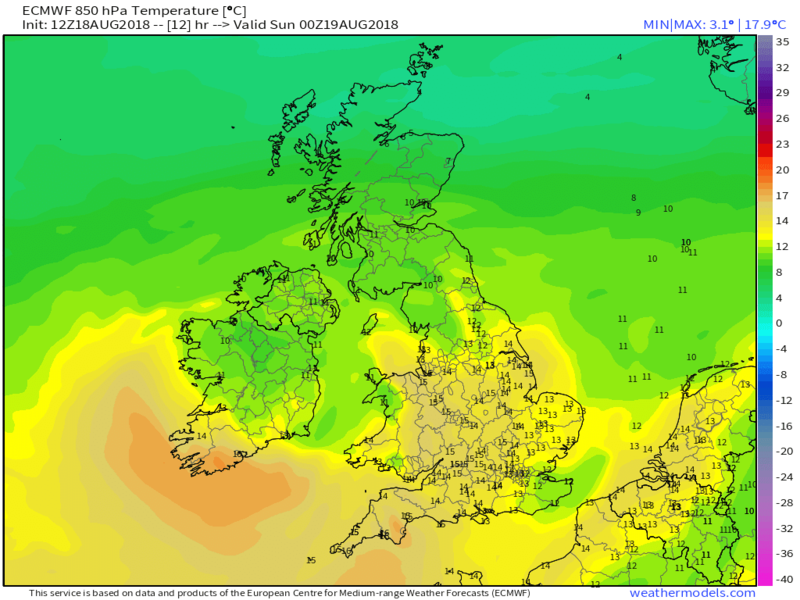 Crap August again for our Northern folk. 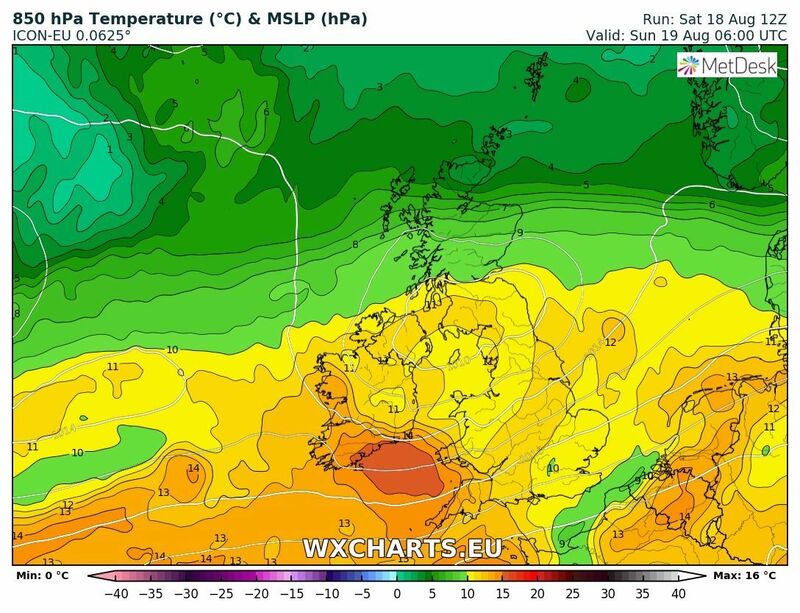 Super nice spell of weather over here and temps just bearable. 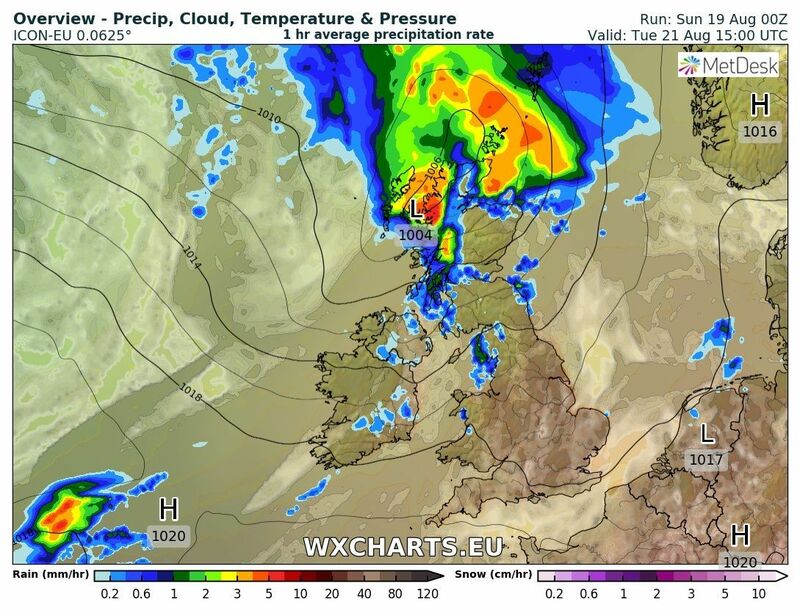 Actually just north of the rain so dry just now and can see clear blue skies/shower cloud to the north across the Firth looking very autumnal as cooler air tries to come south. 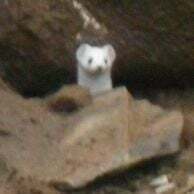 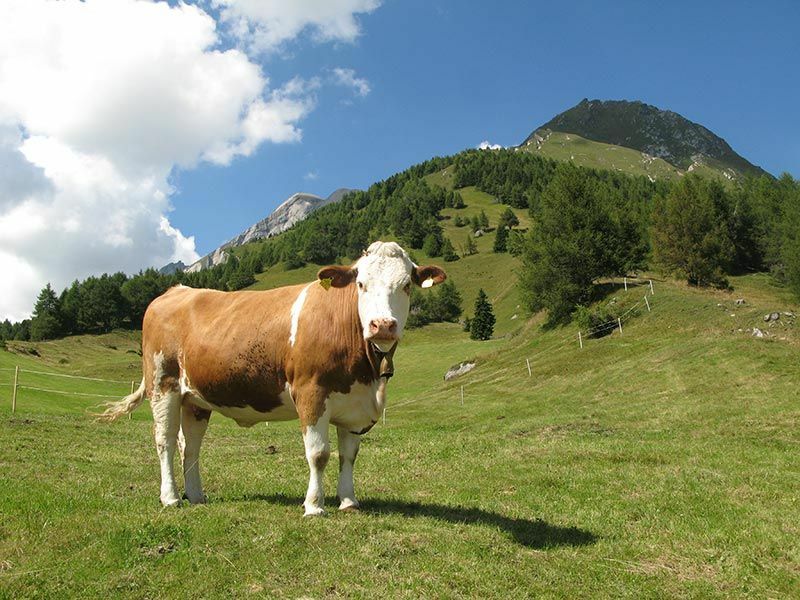 Hi Northern Light, I have followed your great reports from the North and your take on nature on the farm. 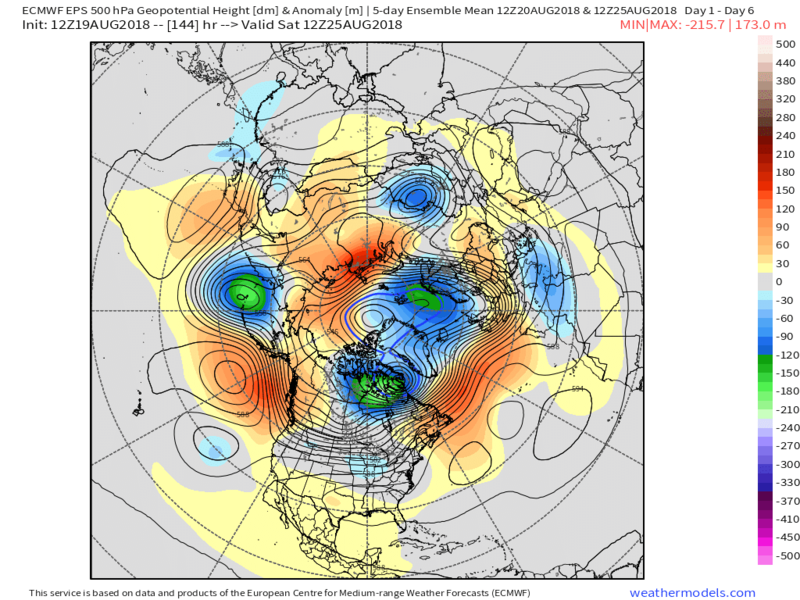 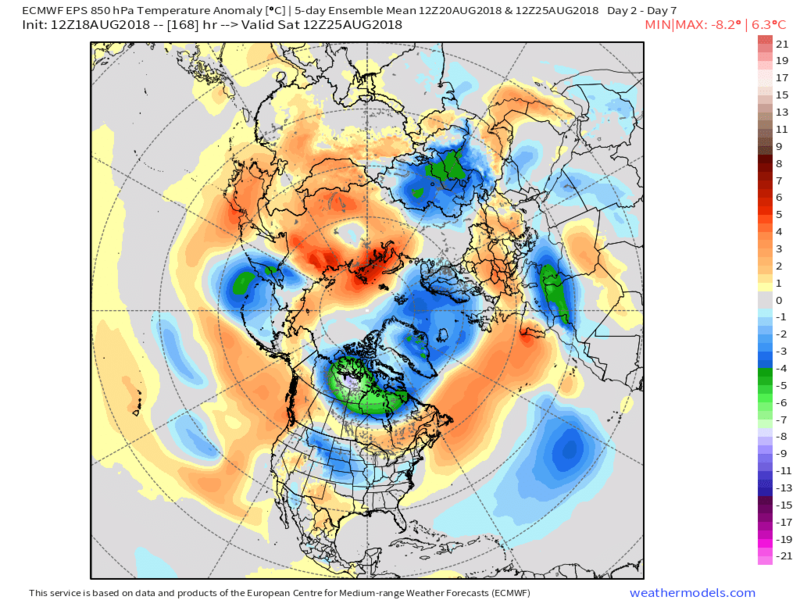  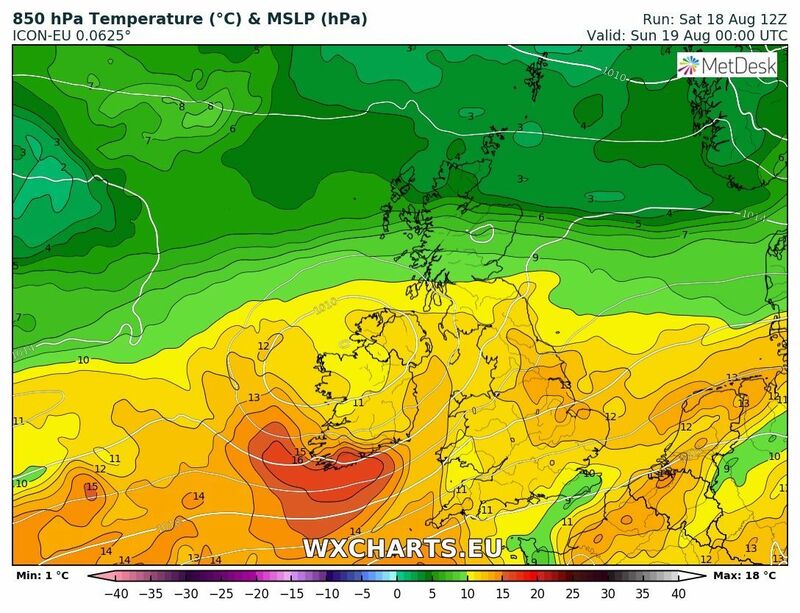 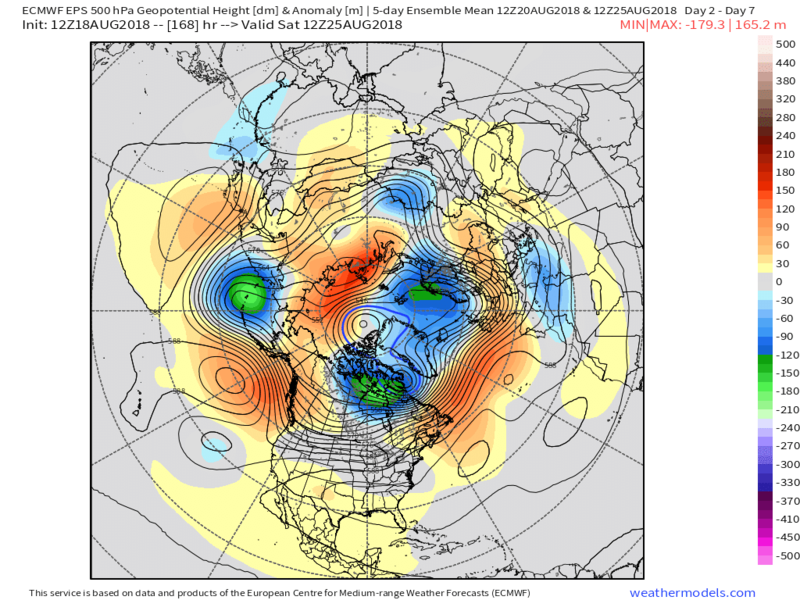 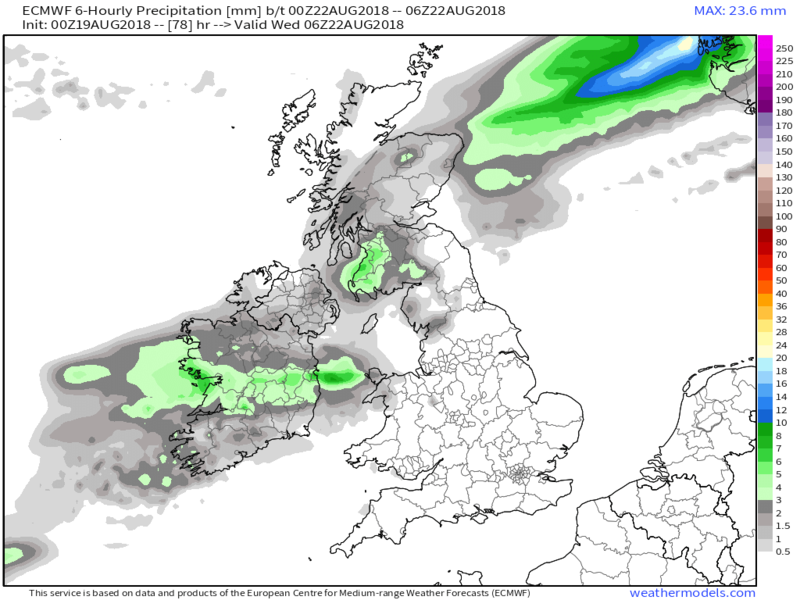 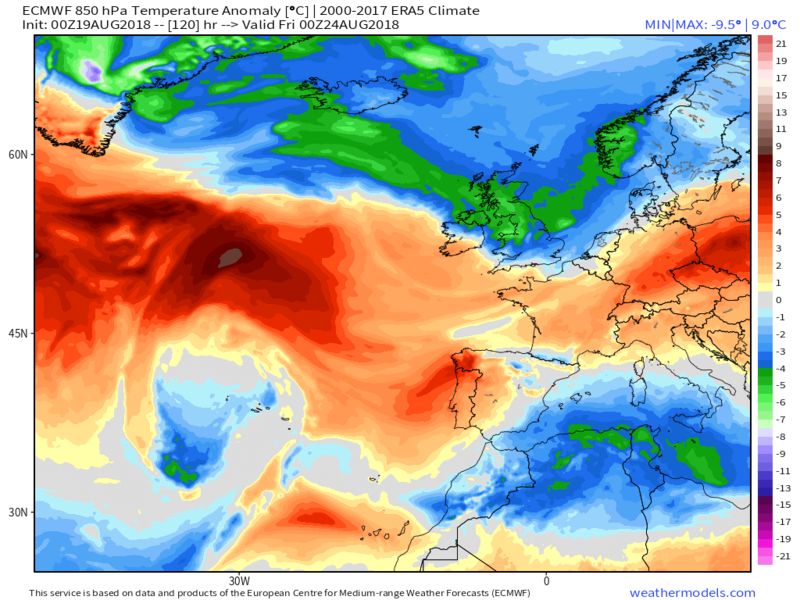 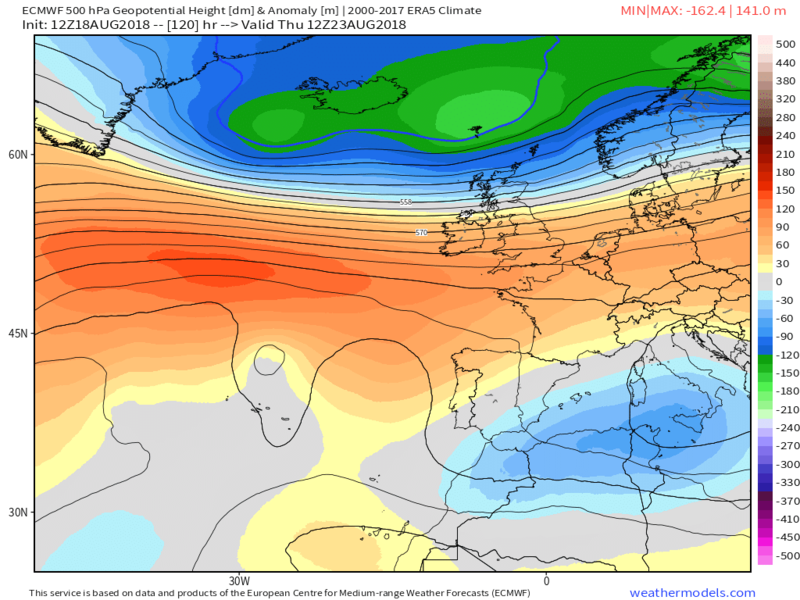 Think you may well have had it quite good summer, locally in your part of the Kingdom, certainly further west has seen a worsening of the summer weather as it progressed. 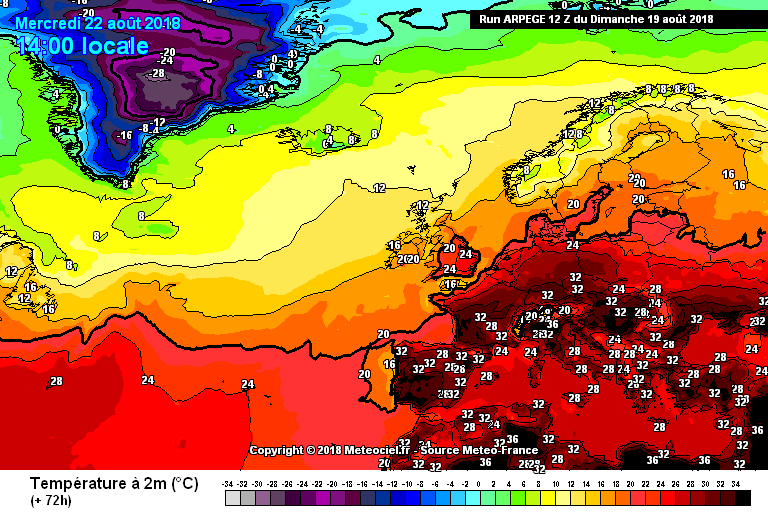 Reached 30c in the valley. Lovely end to the day in the mountains, currently 19c at 20.00 hrs local ( 1670m asl ) Forecast for more of the same this week. 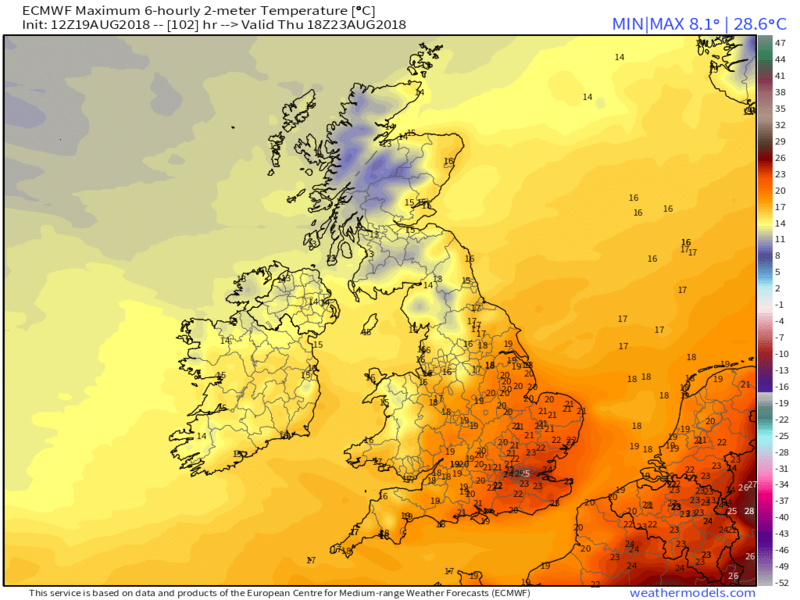 Well Heathrow got to 27.5C and a number of places close to 80F, so hats off to the ECM! 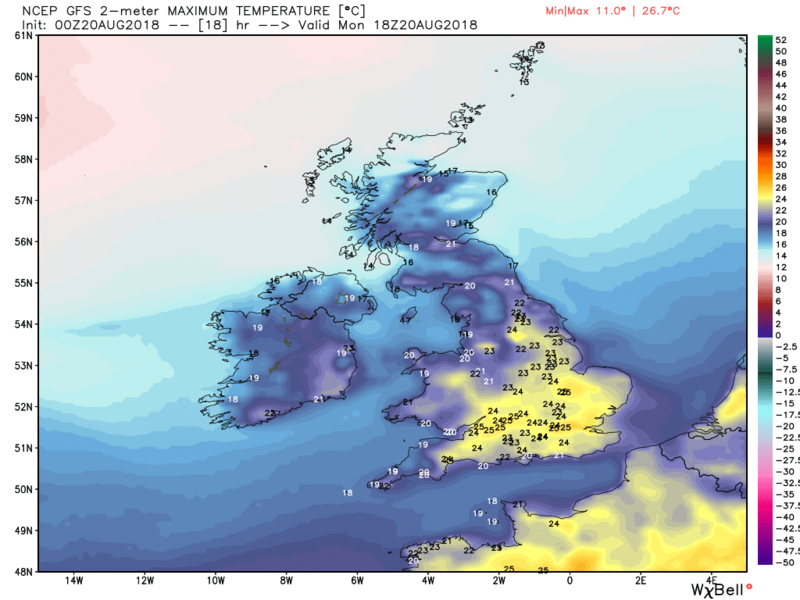 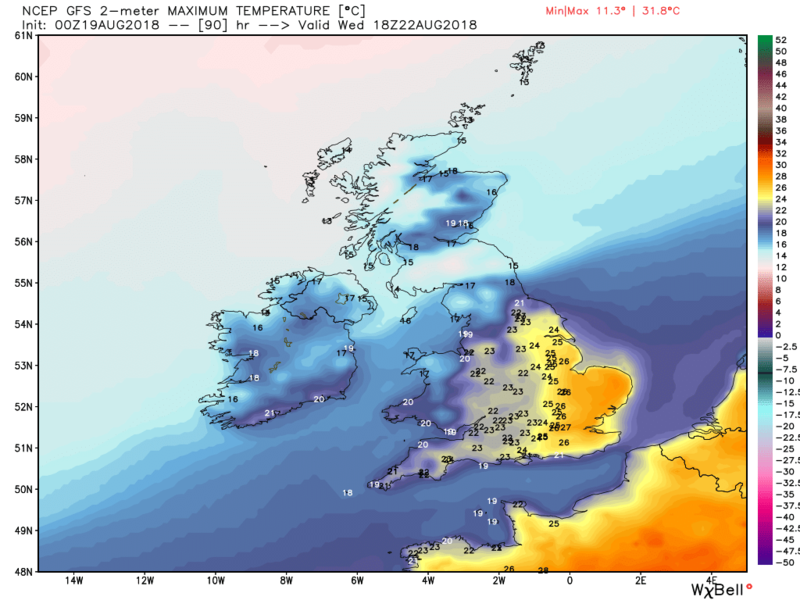 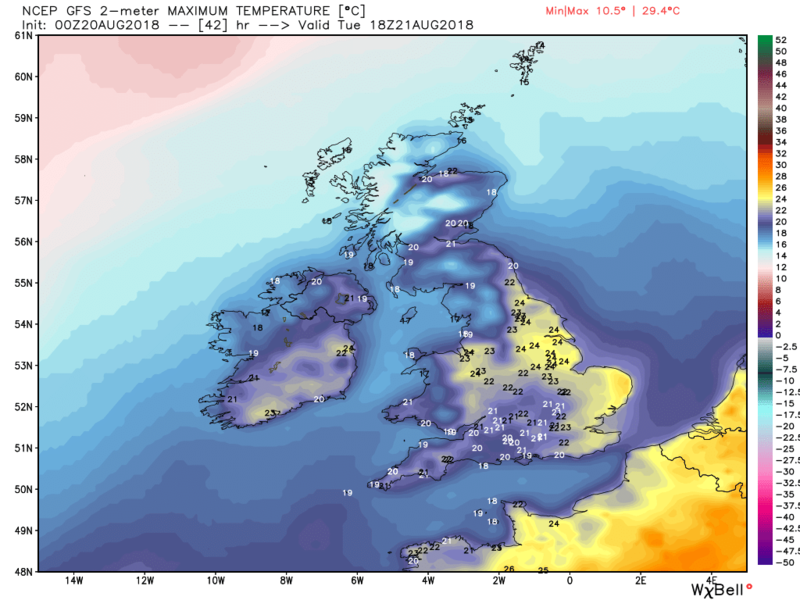 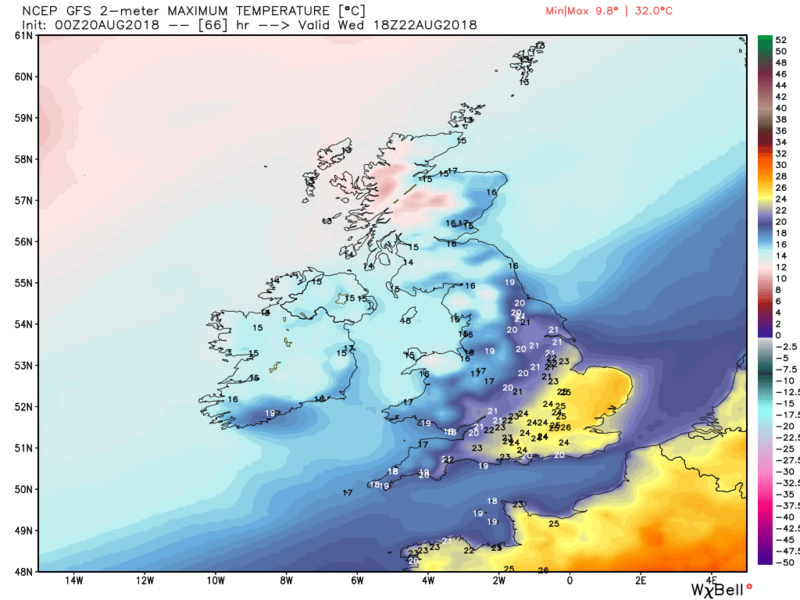 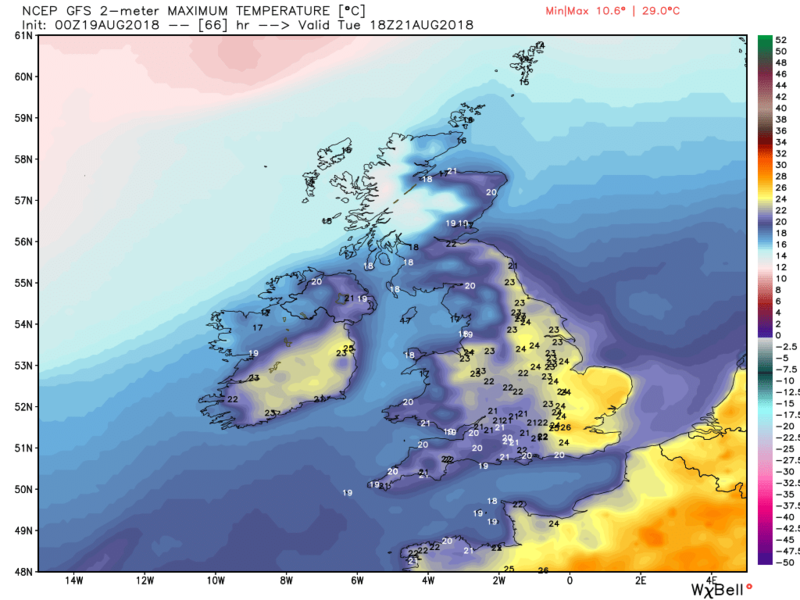 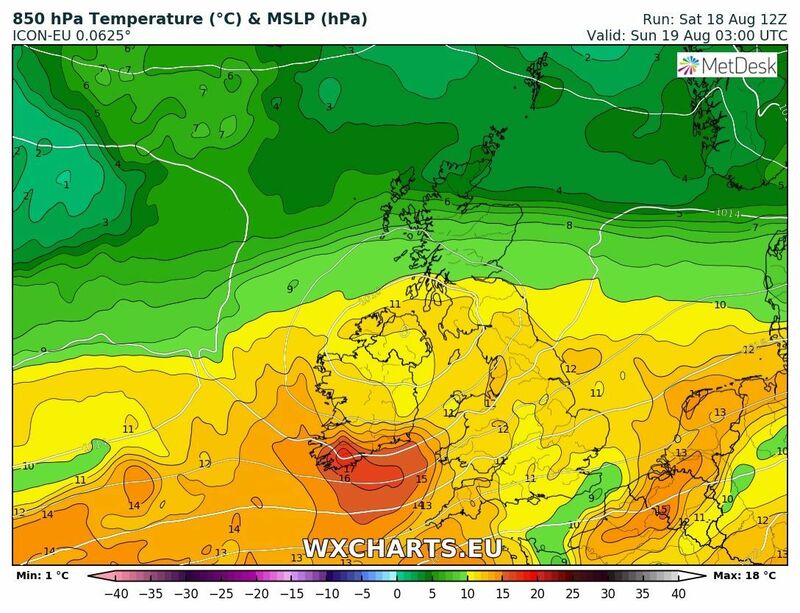 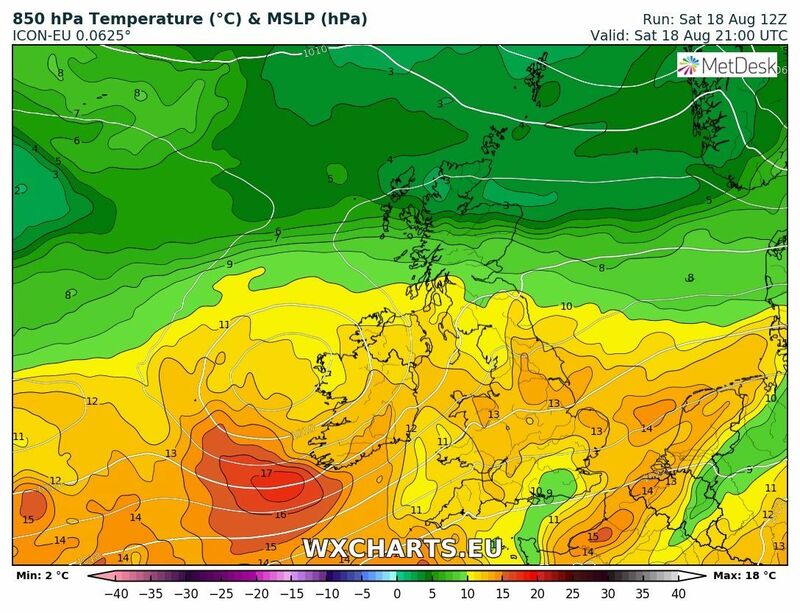 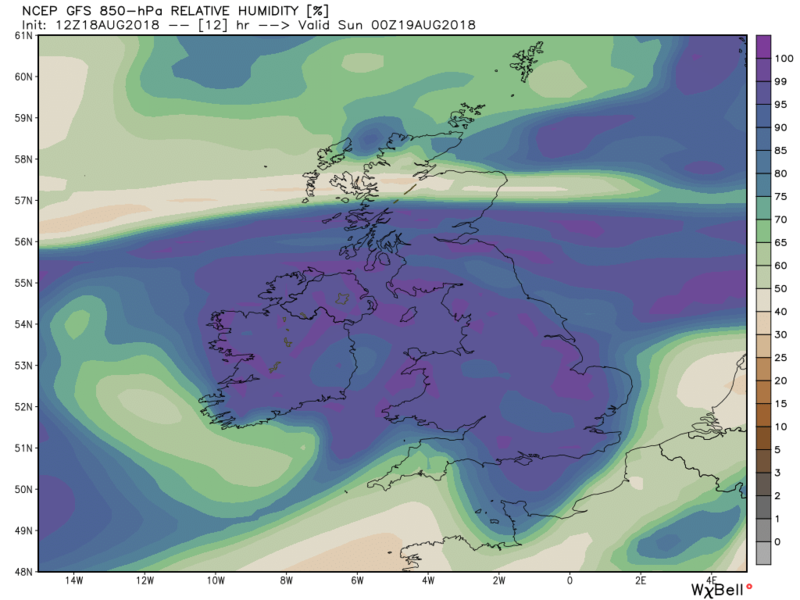 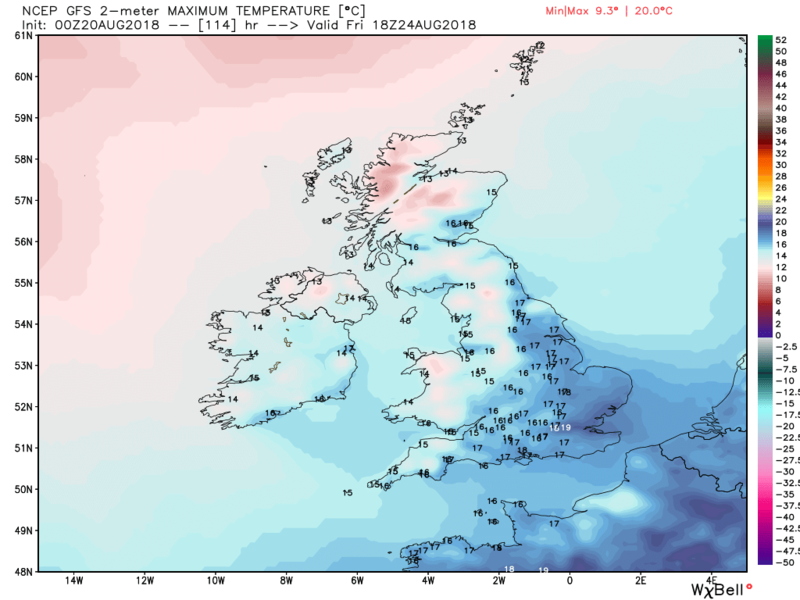 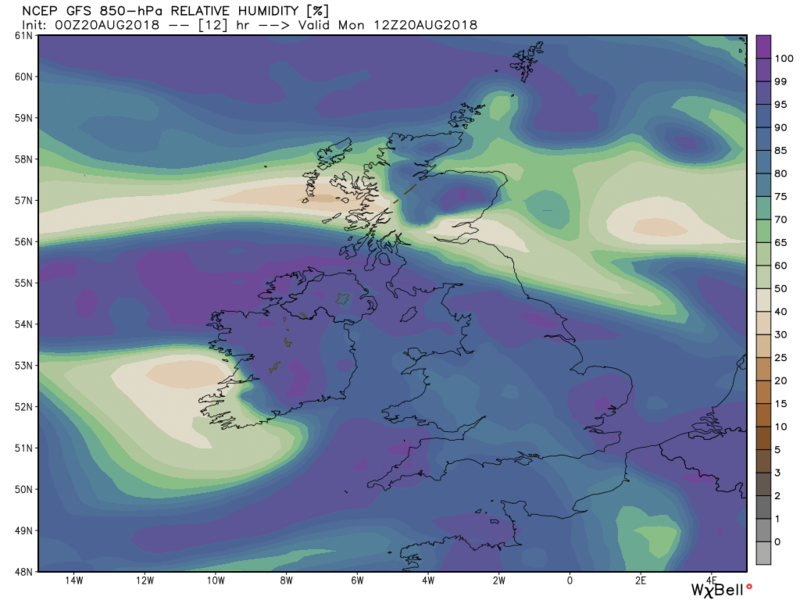 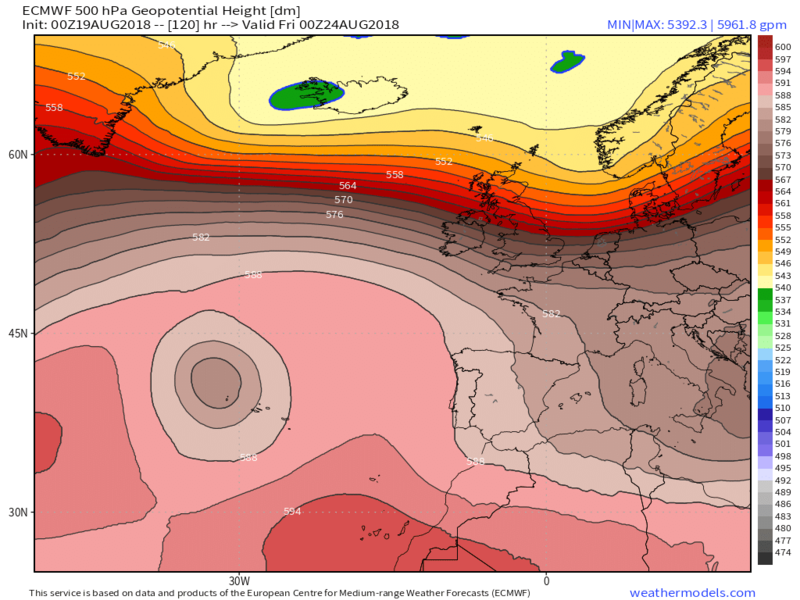 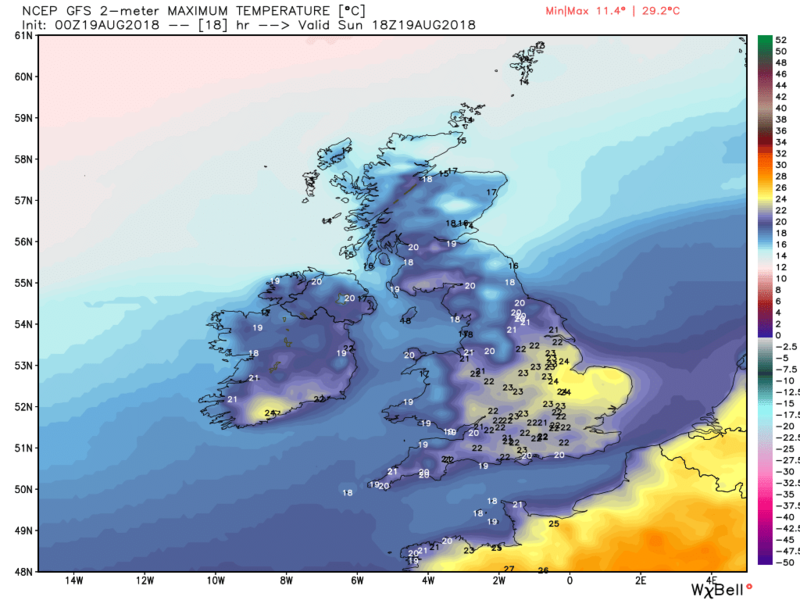 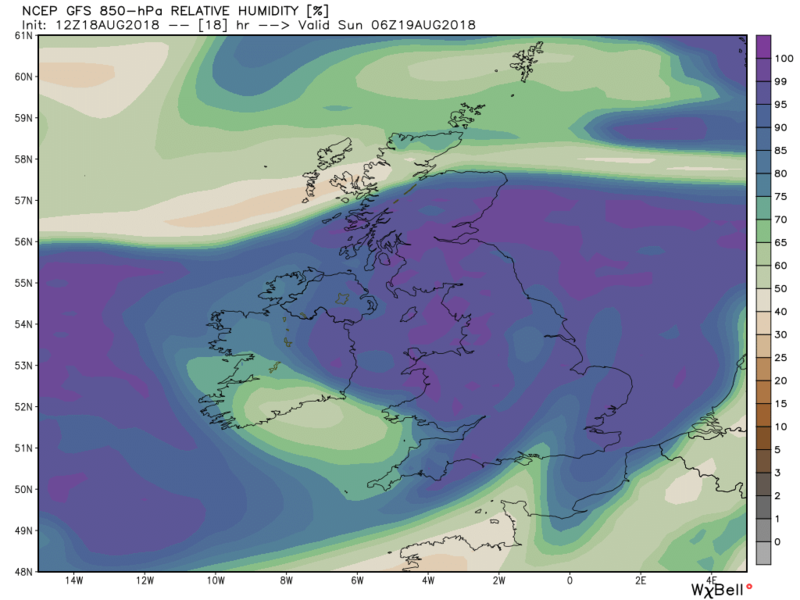 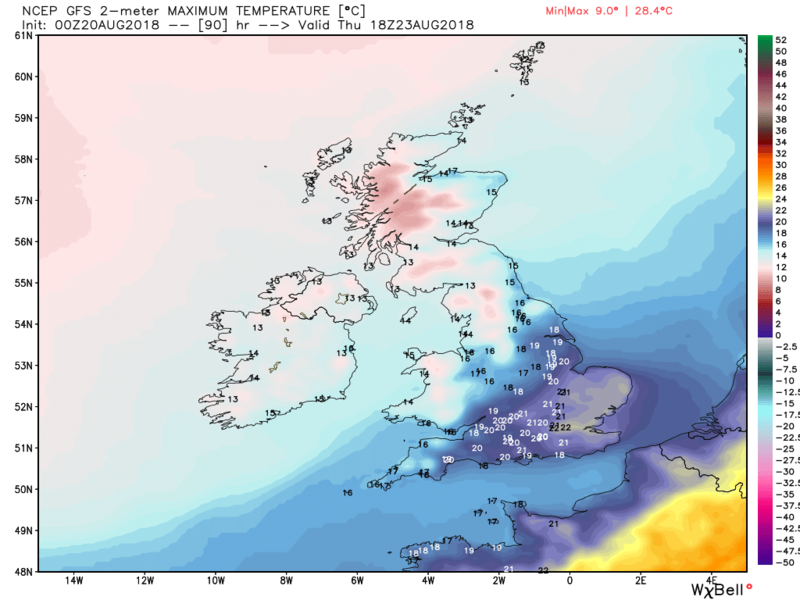 So today sees much of the UK in the humid and warm air, with Just N. Scotland escaping, resulting in a fairly cloudy day for many, particularly in western areas where St and mist may be an issue, but the cloud may tend to break up during the day and where it does it could again get quite warm. 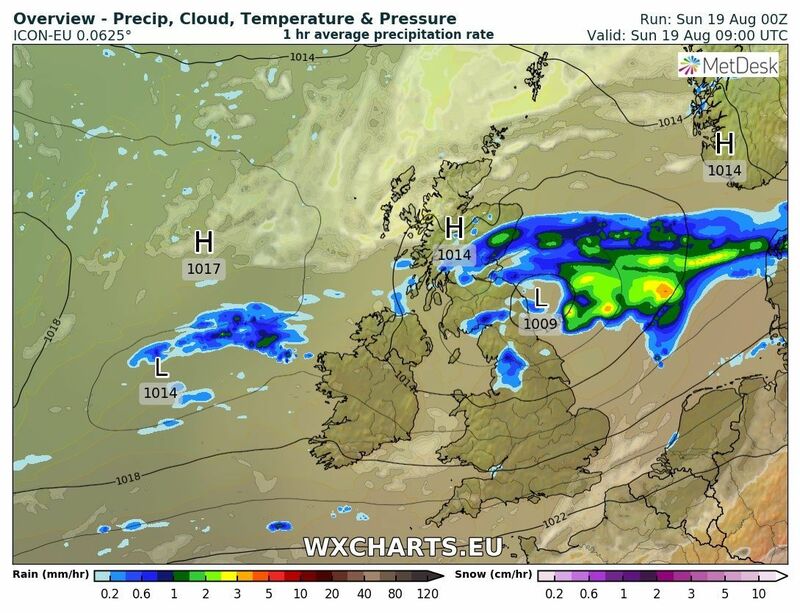 Possibly some light showers sneaking into western areas during the afternoon that will fizzle out by evening. 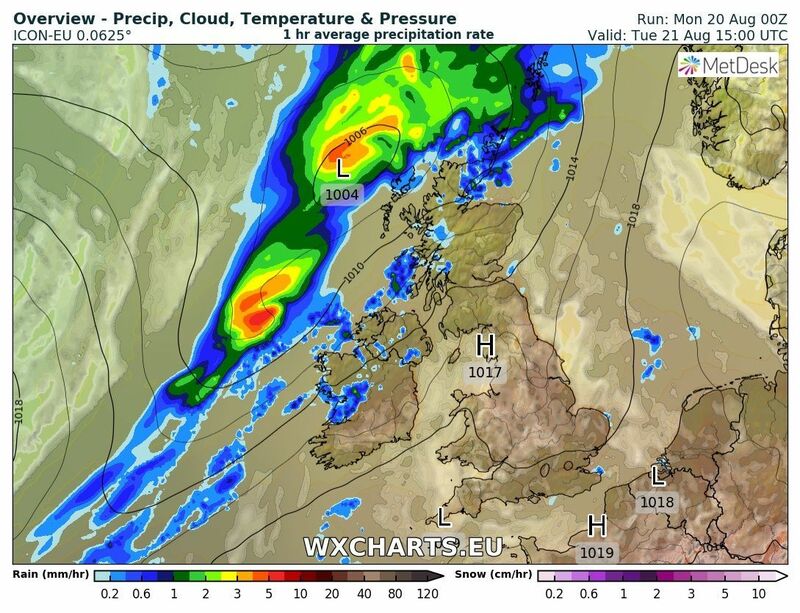 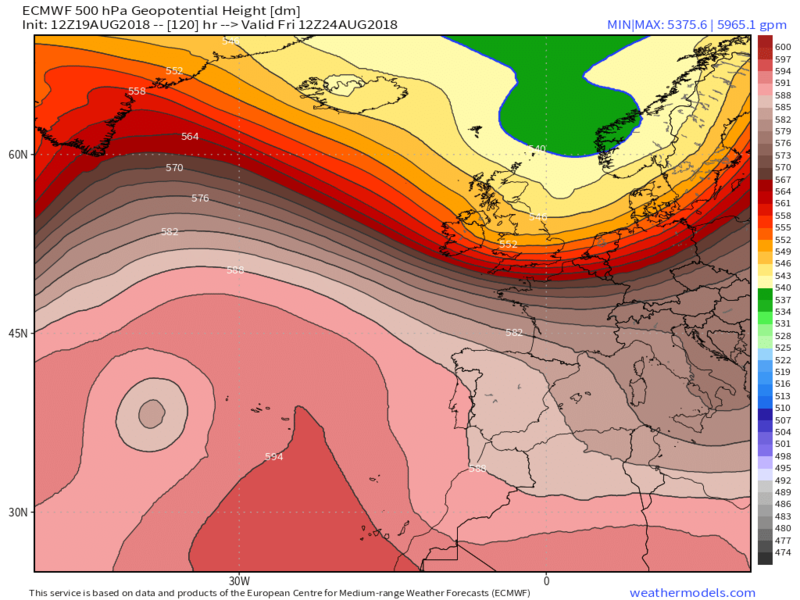 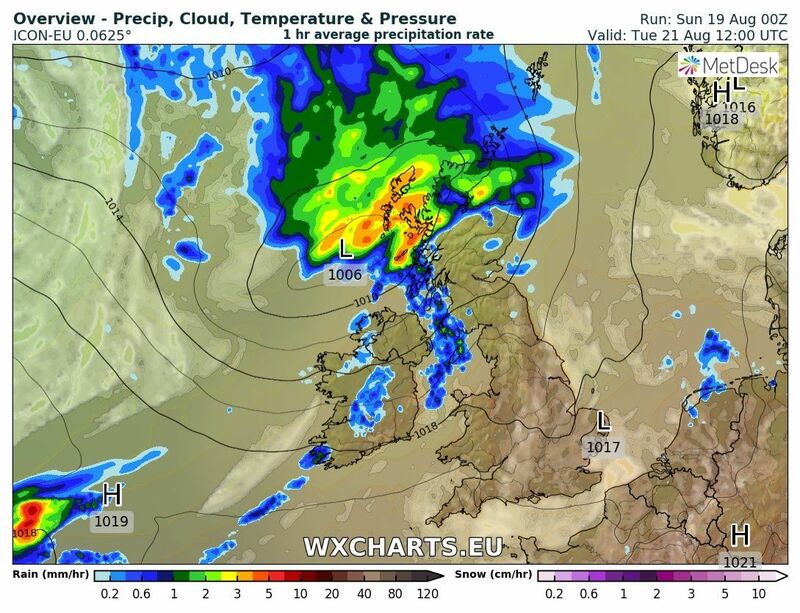 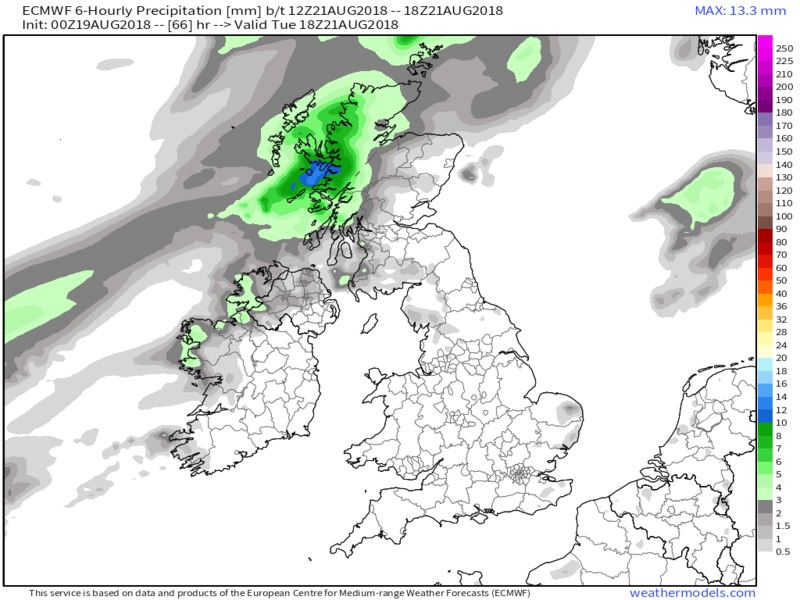 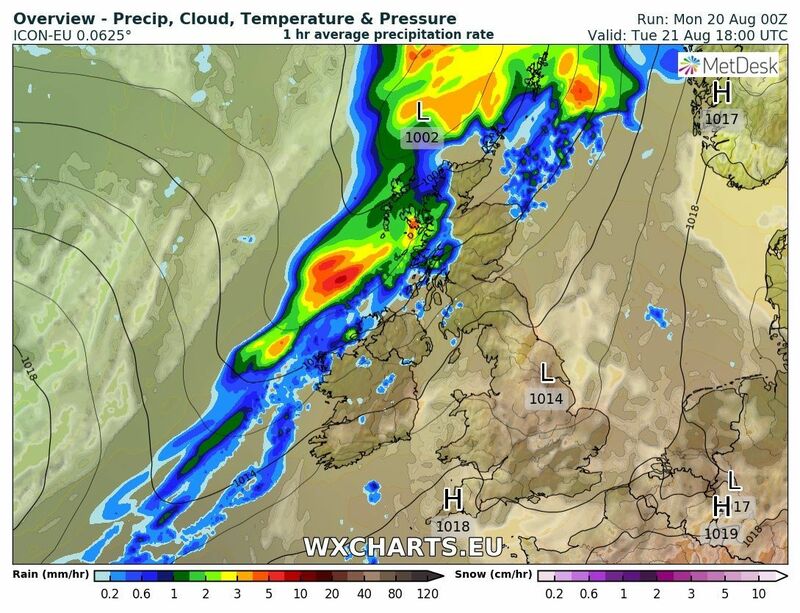 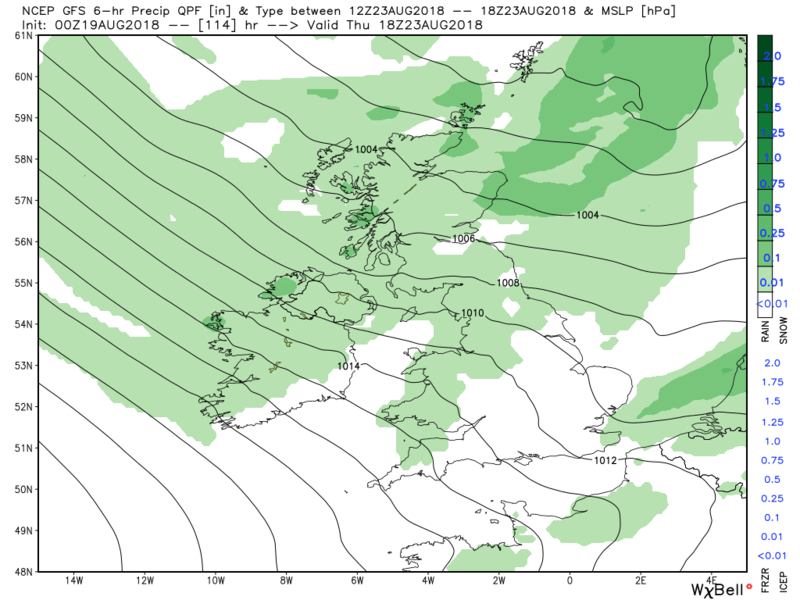 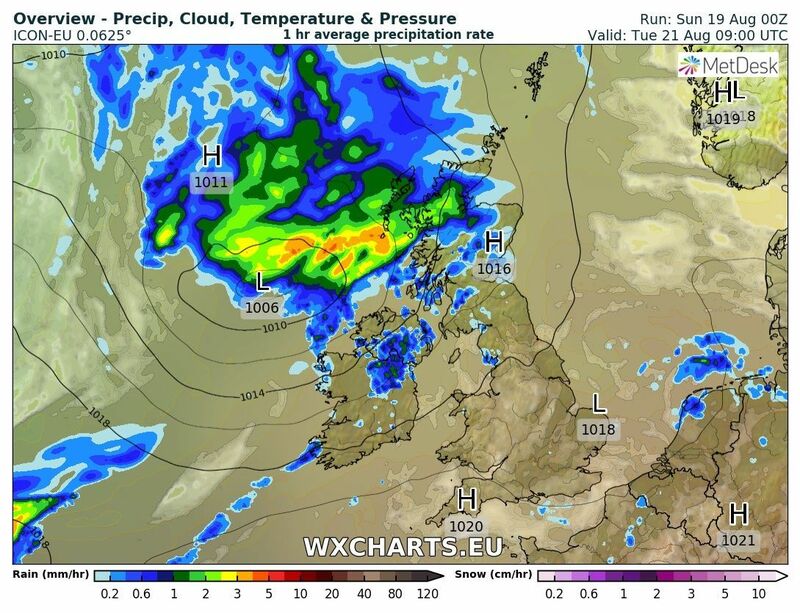 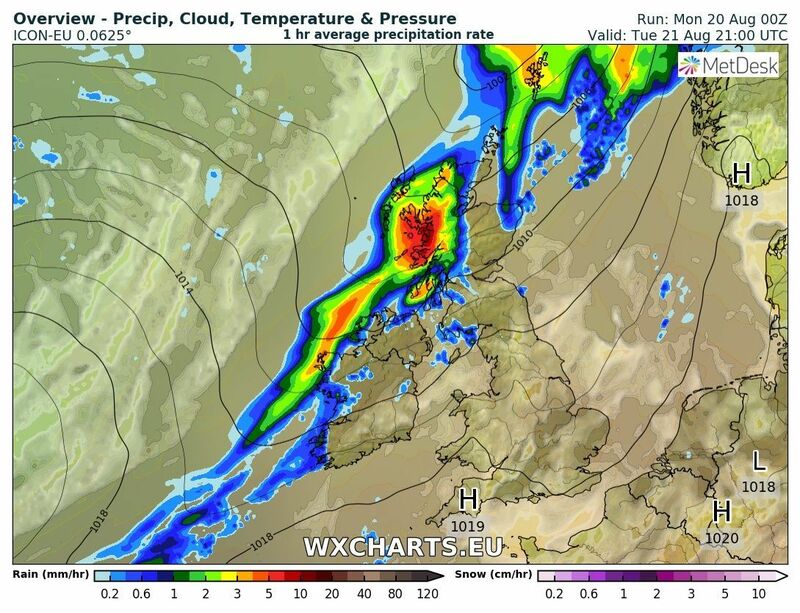 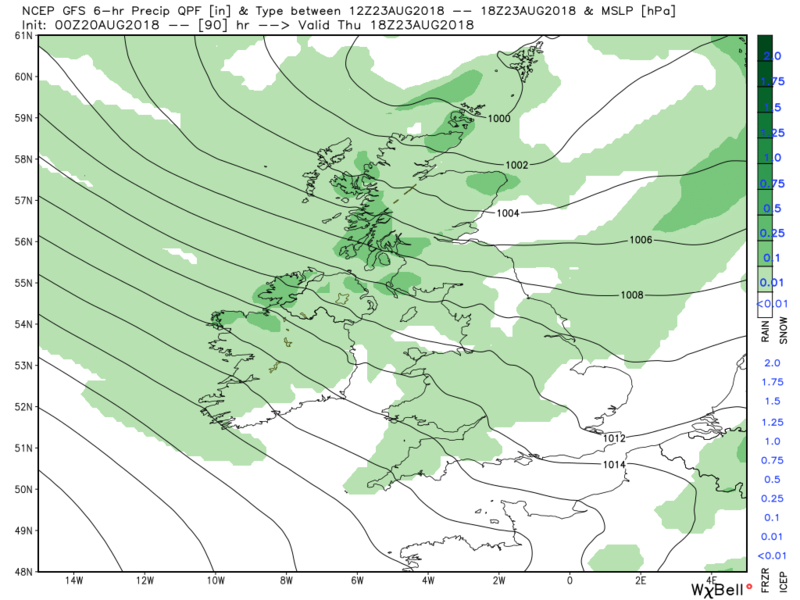 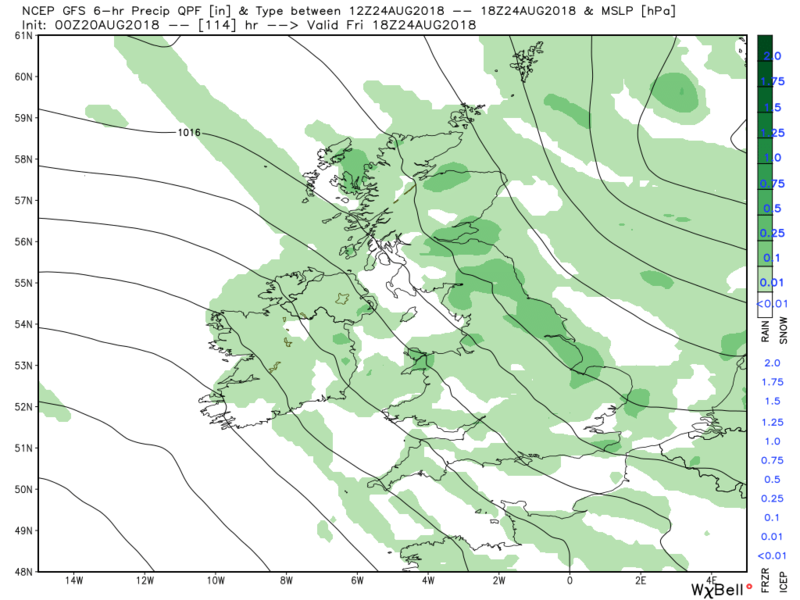 Overnight and through Tuesday much the same picture for England and Wales but the next wave and associated fronts tracks north east during the day bringing rain and windy conditions to N. Ireland and western Scotland by the afternoon. 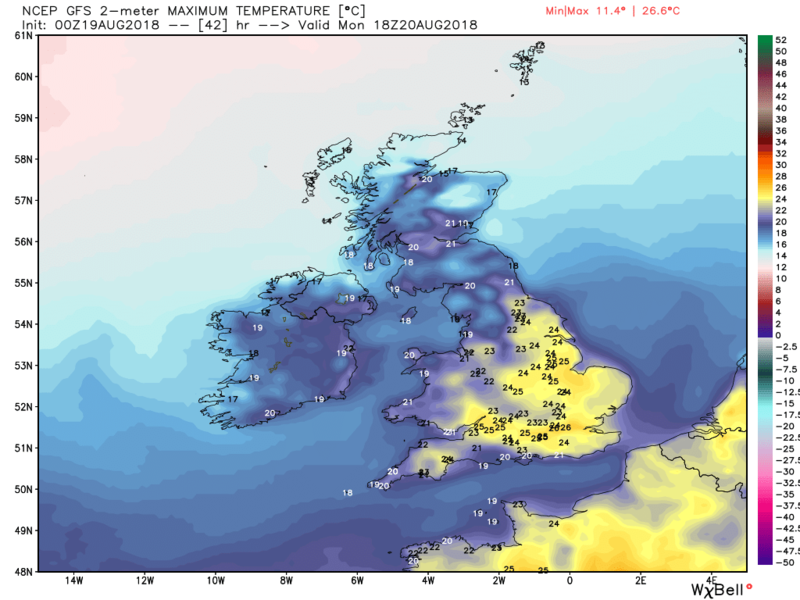 Again temp rather dependent on cloud cover. 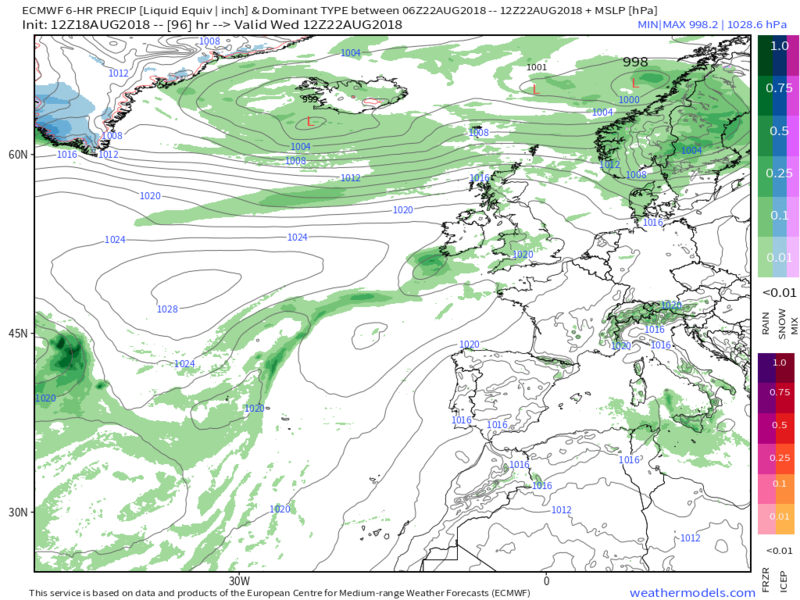 Overnight Tuesday and through Wednesday the low continues to deepen and track NNE whilst the cold front and band of rain moves slowly south east across the country leaving much cooler conditions in it's wake. 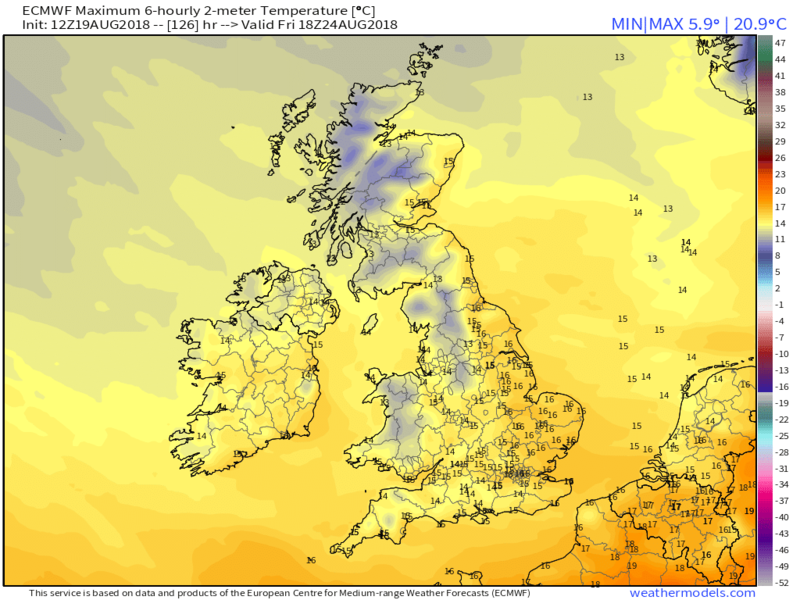 South of the front, particularly in the south east, another quite warm day. 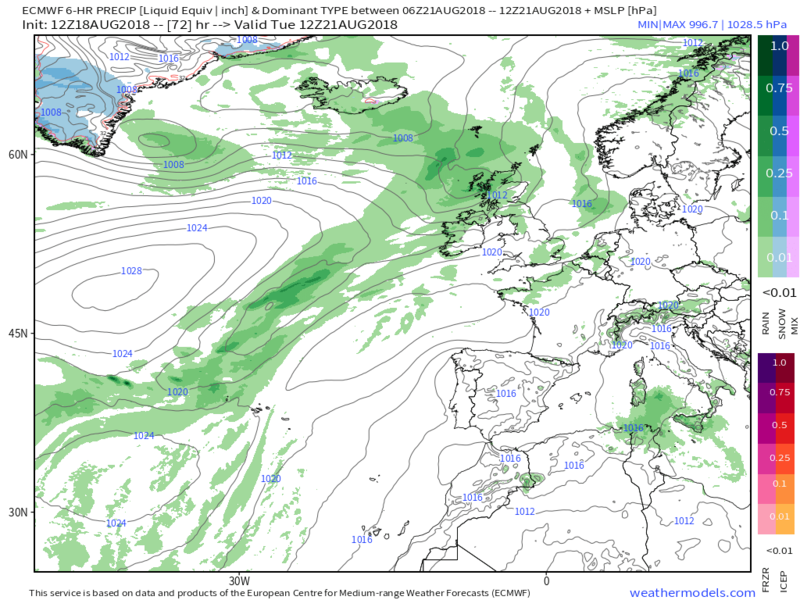 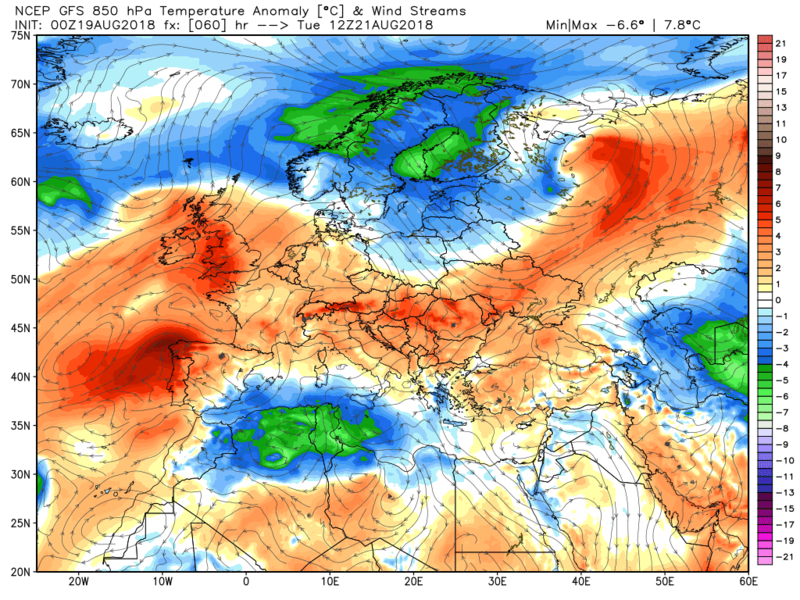 On the surface the cold front has cleared to the south leaving the UK in a cool, unstable and fresh north westerly airstream resulting in sunshine and frequent showers and with temps appreciable lower than of late and below average. 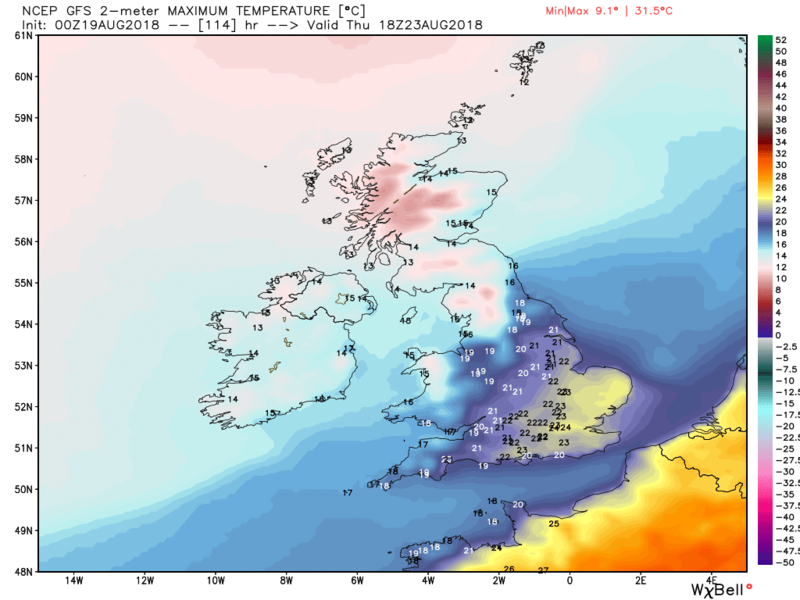 A very similar story on Friday in what is essentially quite a chilly day, especially relative to this summer.